Good news!!! We have figured out how to load .50BMG bullets into 12 gauge hulls!!! 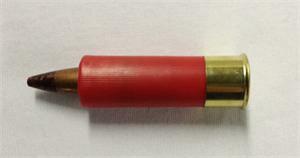 By using a variation of our patented MassForward technology we are able to make the .50BMG round nearly three and a half inches long when the slug exits the barrel. In plain English a portion of the wad stays with the bullet in flight, like fletching on an arrow. Not everyone can own a .50BMG but now everyone who owns a 12 gauge can throw .50BMG rounds down range. This round is loaded with the M17 Tracer and will burn for 3-4 seconds. We have printed 10" groups at 125 yards out of a 19" slug barrel, and had the projectile burn out to 400 Yards. This round is not legal in CA, IL, MA, IA, FL.